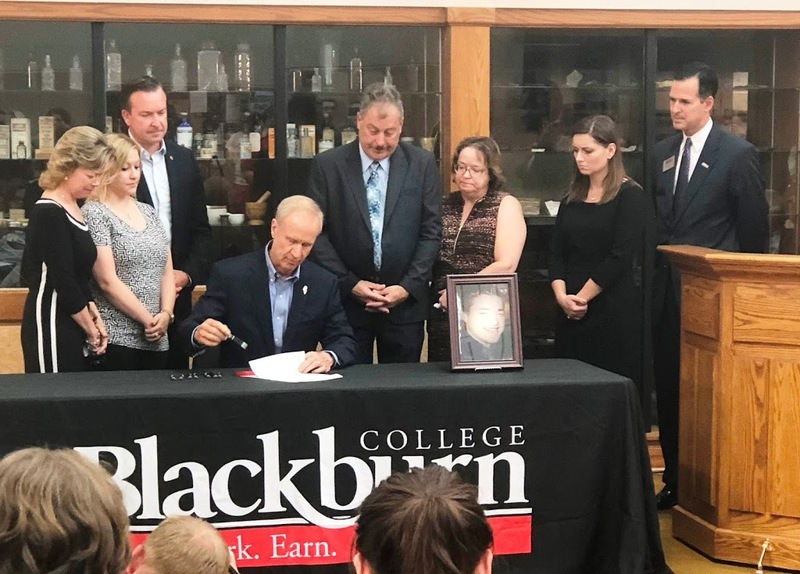 Governor Rauner was at Blackburn College on Tuesday signing legislation into law that changes the way intoxicated minors are processed and ultimately released. This new law, Sponsored in the Illinois House by Representative Bourne, stems from the tragic death of a local young man, Conor Vesper. Attending the signing, are from L-R: Alice Vesper (mother), Hannah Vesper (sister), Senator Andy Manar, Governor Bruce Rauner, Jack Vesper (father), Lori Zenner (family friend), Representative Avery Bourne, and John Comerford (President of Blackburn College).